Explosion prevention from dust build-up is an ever-increasing hazard for tissue manufacturers. Here, Martèl’s chief executive Massimo Bertocchi talks to TW about how its effective removal can create a safer working environment as well as a better end product. In converting processes, effective dust removal is becoming ever more important. How successful it is affects the quality of the final product and also impacts the safety of the whole factory. During the transformation of raw materials into the final product, tissue machines produce dust particles and the quantity produced mainly depends on the type of paper, the process and the speed of the machines. However, the amount of dust removed from the production department depends solely on the type and efficiency of the suction and filtering plant. Any contamination of the final product by a different type of dust unequivocally compromises the quality and any concentration of paper dust in a closed environment can create an explosive mixture. This dangerous mixture is one of the biggest risks in factories. Incredibly, this risk is frequently directly increased by the old filtering system that uses bag filters that accumulate dust in big quantities on the surface and then at a certain moment when the filter starts the cleaning process, blowing compressed air from the clear side of the filter, generating a detachment of the dust from the surface of the bags and generating a cloud of dust in high concentration. This is the most dangerous situation for explosion prevention. A typical way to reduce this risk on bag filter plants is to repeatedly start a cleaning process, but this trick doesn’t fix the problem. In fact it simply reduces the risk and increases the energy consumption of the air compressor. Technically speaking, a valid solution for this explosion risk is the use of water filters (scrubbers) to catch the dust, but the costs of the plant grows significantly and the necessity of successive water treatment makes this solution not convenient in factories without paper pulpers. The Multi Waste filter is a completely different system that solves the explosion risk at its root, without using any water in the process. Multi Waste achieves this result because it’s a dry filter with a continuous cleaning system that removes the dust preventing the accumulation inside the filter. In fact, the dust is continuously and automatically compacted by a worm screw and expelled to be disposed, or recycled when possible. 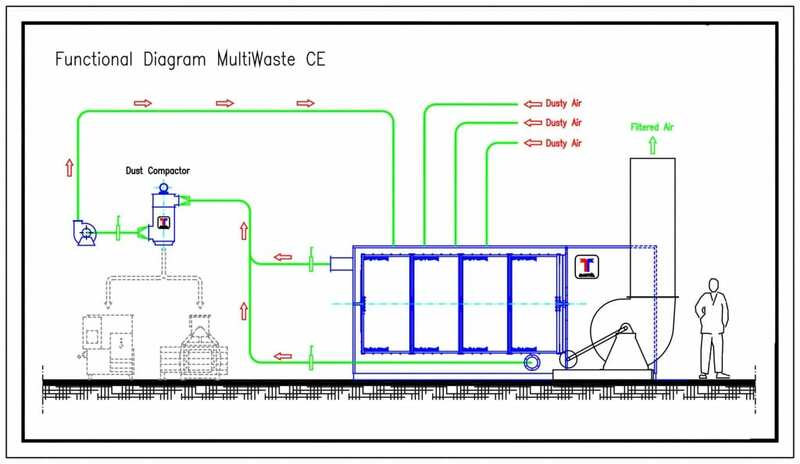 Dusty air enters into the top side of the main chamber of the Multi Waste filter and then is uniformly distributed on the self-cleaning cylinder. During this process the air is forced to rotate around the cylinder releasing eventual heavy particles in a specific collection point. Finally the air passes through the cylinder leaving the fine dust on the filtering surface where cleaning nozzles continuously removes the dust. The dust is then sent to the compactor. Typical devices used to discharge the collected dust. 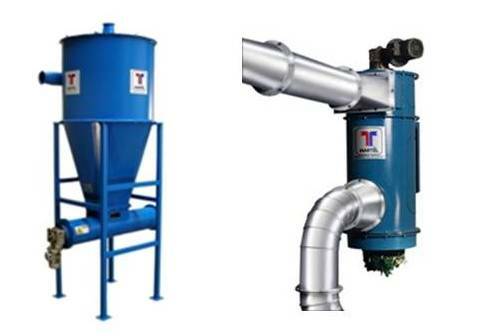 On the left is the cyclone separator with final horizontal screw conveyor. The second is a vertical compactor where the screw conveyor is inside in a vertical position. • Absence of explosion risk. • Reduction of energy consumption (for example a bag filter for 100’000 m3/h needs roughly 36 Kw of energy plus the energy for the compressed air; a Multi Waste for 100’000 m3/h needs only 18 Kw without any additional source of energy). • Reduction of spaces necessary for the filtering plant. 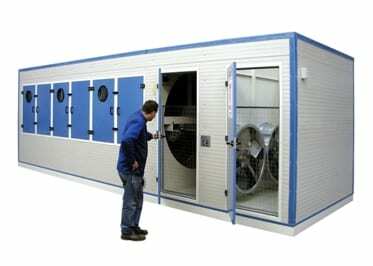 • Fast installation thanks to preassembled transportable version. • Possibility of installation inside or outside of the building. • From 10’000 m3/h to 80’000 m3/h for the preassembled version, transportable on standard truck. • Till 180’0000 m3/h for the “Multi Waste Export” version, that is prefabricated but not assembled and it can be shipped in standard containers. Some 36 factories in Europe are already using the Multi Waste system instead of bags filters or scrubbers, two of which are renown companies in the paper sector: WEPA Lucca (four Multi Waste each of 75’000 m3/h installed in two factories in Lucca, Italy) and Industrie Cartarie Tronchetti (five Multi Waste each of 50’000 m3/h and one Multi Waste of 25’000 m3/h installed in the factory located in Pannes, France). Share the post "The importance of effective dust removal"